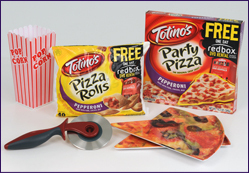 DnBuster's Place: Totino’s Fun Friday Night review and Giveaway! By the time Friday rolls around you’re ready to leave your work at the office, save the homework for tomorrow, and unwind with a quick and easy dinner. Enjoy a classic favorite – pizza and a movie – for a Fun Friday Night with your family and friends! With the help of Totino’s Pizza Rolls and Party Pizzas, you can serve a convenient meal that the whole family will love and still have plenty of time to sink into the couch to watch the latest movie rental from redbox. Thanks to MyBlogSpark and Totino's the kiddos and I enjoyed pizza, roll snacks and a movie! We enjoyed cheese pizza and pepperoni rolls! The kiddos liked playing with the pizza cutter so much they cut up the rolls. YUMMY! We a great family night. We also popped up some popcorn and enjoyed the movie Fast Five! The kiddos shared the pop corn bucket with no fighting..lol~ No fighting makes a great night! MyBlogSpark and Totino's wanna share the same gift pack that I received with one of my readers to have their own Fun Friday Night! One of my lucky readers will have all the items they need to have a great family night! How to enter: All entries must be submitted using the Rafflecopter form below. The mandatory entries are listed at the top and must be done first. Hit “click for instructions” under each entry, and the necessary links or info will appear. Then click the green “I did this” button, and it will prompt for your email address and any information needed to verify the entry, such as your twitter username. To increase your chances of winning, you can complete any of the extra optional entries. With more than 27,800 locations, and available nationally at Walmart, there’s always a redbox kiosk nearby! Find the closest redbox kiosk by checking http://www.redbox.com/locations. Thanks to MyBlogSpark and Totino's for providing these awesome items that provided me and my family and one of my readers with this Totino's Fun Friday Night package! This is a awesome prize would sure love to win this.